AUTHORS around Bognor Regis are looking for other residents who are made of the ‘write stuff’. The Bognor Regis Write Club is staging its first short story competition. The winner will receive £100, with £50 for the runner-up and a £25 third prize. The 20-25 shortlisted writers will have their work published in a book to be launched at the prize-giving ceremony this summer. Family and friends will be invited to the event. The chosen writers will receive a free copy of the book. Guests can buy further copies at a discounted price. Julia Macfarlane, who runs the club, said: “This will be the third anthology the club has published. “We have also produced the Chichester Ghost Tour, all of which events have sold well. “It’s our first attempt at a public competition, so be gentle with us. “We owe a big thank you to Zoom Internet Ltd, who have sponsored us. The competition is open to residents aged more than 18 in the Bognor Regis area and includes the postcodes: PO9, PO10, PO11, PO18, PO20, PO21 and PO22. Bognor Regis Write Club meets monthly at The Waverley on Marine Drive West and has a short waiting list for new members. The group offers feedback and support to each other, whether they are poets, short story writers, novelists or playwrights who are published or are working towards publication. 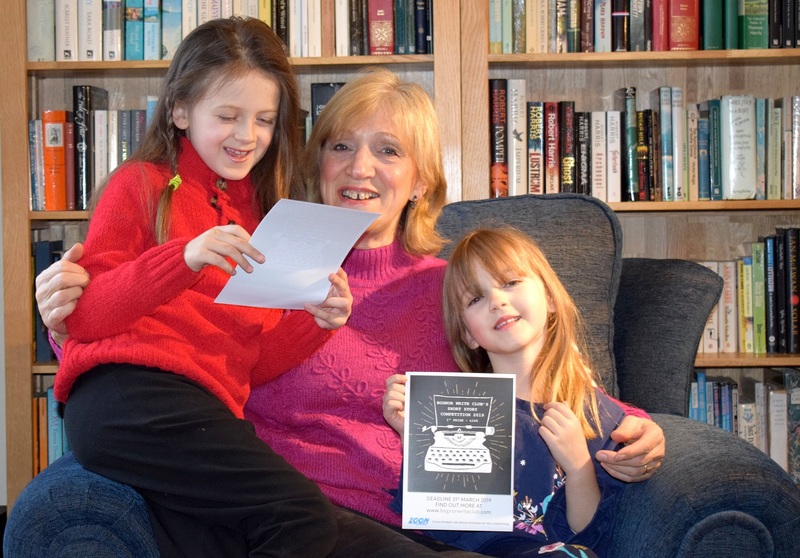 Pictured above promoting the competition are Julia and her grand-daughters, Alice and Naomi Robbins.